This Copycat Wendy’s Frosty Recipe is low-fat and so easy to whip up! 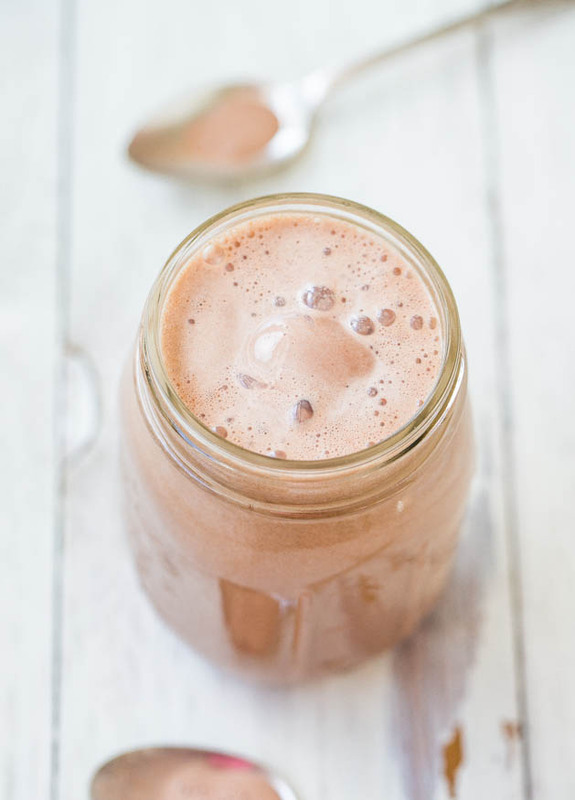 It tastes like a lighter chocolate milkshake, but it’s still super creamy and delicious. I haven’t had a Frosty in about 15 years, but it popped into my head and I had to have one. Except I knew I wasn’t going to Wendy’s for one, so I had better make it myself. This copycat Wendy’s frosty recipe is fast, dangerously easy, and you don’t need an ice cream maker to achieve that creamy consistency. Simply add 4 ingredients to your blender, whiz, divide it between two mugs, freeze for 30 minutes, and enjoy. Way too easy! The results are every bit as good as Wendy’s, and the taste and texture is spot-on. As a bonus, my version is low-fat and while no one should ever confuse Frostys with health food, this version is lighter than the real thing. I used fat-free versions of whipped topping and sweetened condensed milk, the chocolate milk is low-fat, and there’s no fat in cocoa powder. If you want to use full-fat products, be my guest. You could likely keep the Frosty vegan by using vegan whipped topping, omit the sweetened condensed milk, and use chocolate almond milk instead. It’s smooth, creamy, rich, sweet, and refreshing with nostalgic charm. I used restraint to not down the entire batch. My 7-year old inhaled about 18 ounces of Frosty in 18 seconds. Wish I still had that metabolism! She requested that I make more of this — like asap. I love cold treats even more when they get melty. Something tells me some Homemade Baileys would make me love the melty parts even that much more. This Wendy’s Frosty recipe is essentially a lightened up chocolate milkshake. 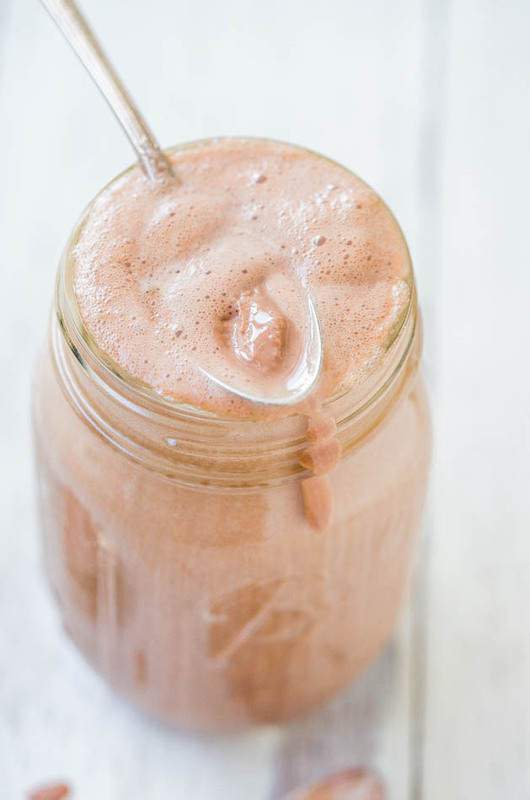 For this easy milkshake recipe, you’ll need frozen whipped topping (such as Cool Whip), sweetened condensed milk, unsweetened cocoa powder, and chocolate milk. So simple, right? Which means it’s dangerously easy to make a Frosty whenever you want one! Add the Frosty ingredients into a blender and blend until smooth. Then, pour the Frosty mixture into two glasses and freeze for 30 minutes to an hour until it’s the consistency you want. Don’t forget to give your Frosty a good stir before digging in! You can actually make a big batch of homemade Frostys and store them in the freezer for up to a month. Just make sure to cover the glasses in plastic wrap or store the mixture in plastic bags so the Frostys don’t soak up any smells from the freezer. If your Frosty is frozen solid, let it sit at room temperature for half an hour before enjoying. It’ll become thick and creamy in no time! 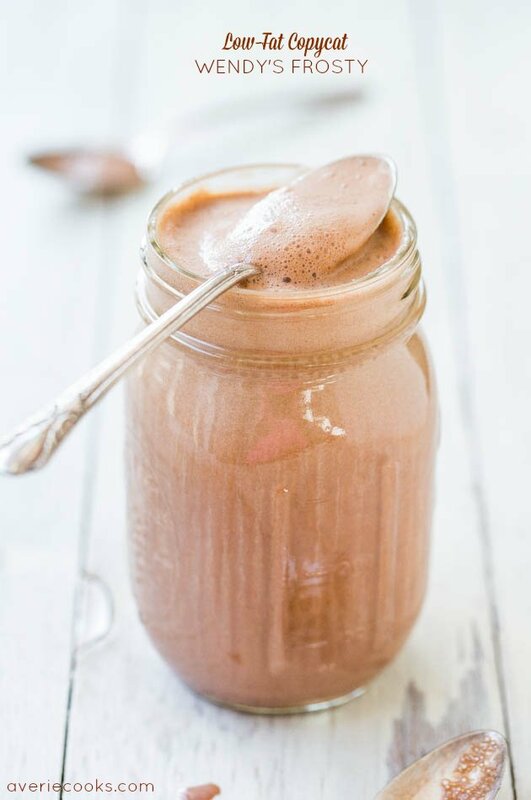 Lightened Up Cookies and Cream Mocha Milkshake — These milkshakes are sweet, creamy, rich, satisfying, and I used lighter versions of ingredients. Chocolate Peanut Butter Graham Fudge Pops — These homemade fudgiscles are very chocolaty, rich, and taste much more decadent than their 80 calories would have you believe! Fudgy Brownie Cookie Dough Ice Cream Sandwiches — Cookie dough ice cream is flanked between two rich and fudgy brownies, creating an enhanced and more decadent version of a classic ice cream sandwich. 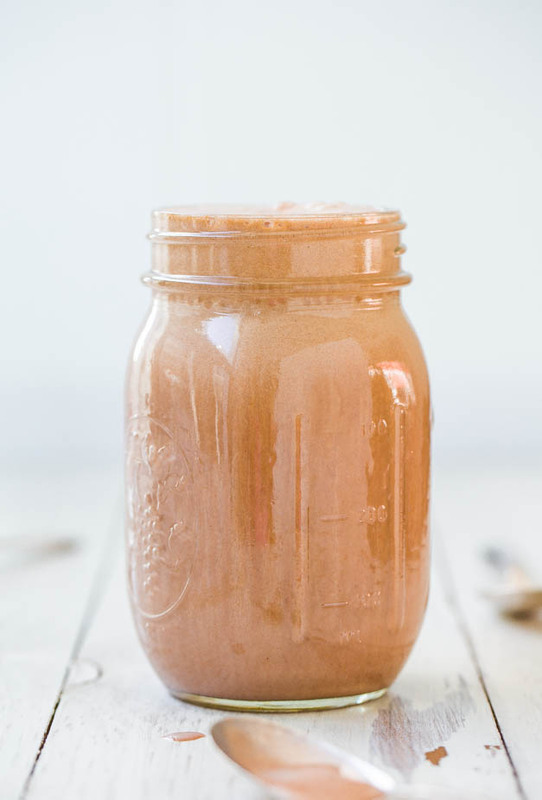 To the canister of a blender, add the whipped topping, sweetened condensed milk, cocoa powder, pour the milk over the top, and blend until smooth and creamy. Pour mixture into 2 glasses and freeze for about 30 to 60 minutes, or until desired consistency is reached. Stir well before serving. Extra portion will keep airtight in the freezer for up to 1 month (cover glasses with plastic wrap or place inside a ziplock to prevent freezer smells). Allow to come up to room temp for about 30 minutes before serving if frozen solid. *I used fat-free Cool Whip; lite, regular, or vegan versions may be substituted. **I used 1% chocolate milk; chocolate almond milk may be substituted. 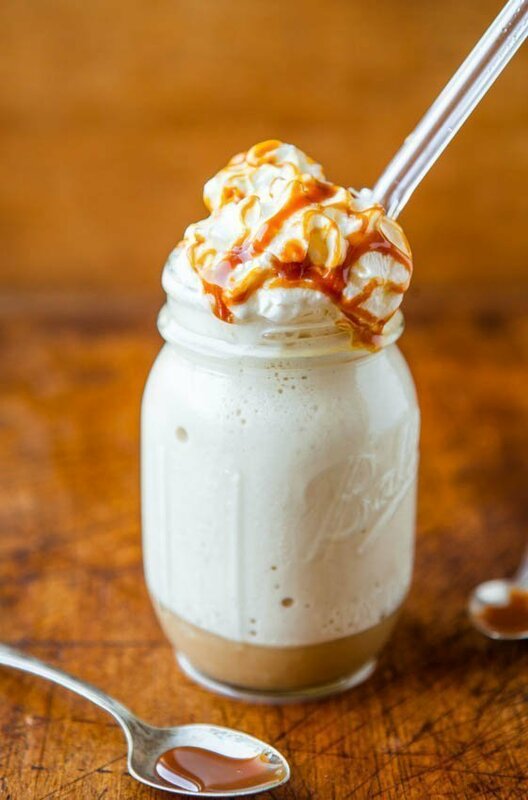 Skinny Caramel Frappuccino — Only 50 Calories Per Serving. Think of all the money and calories you’ll save! 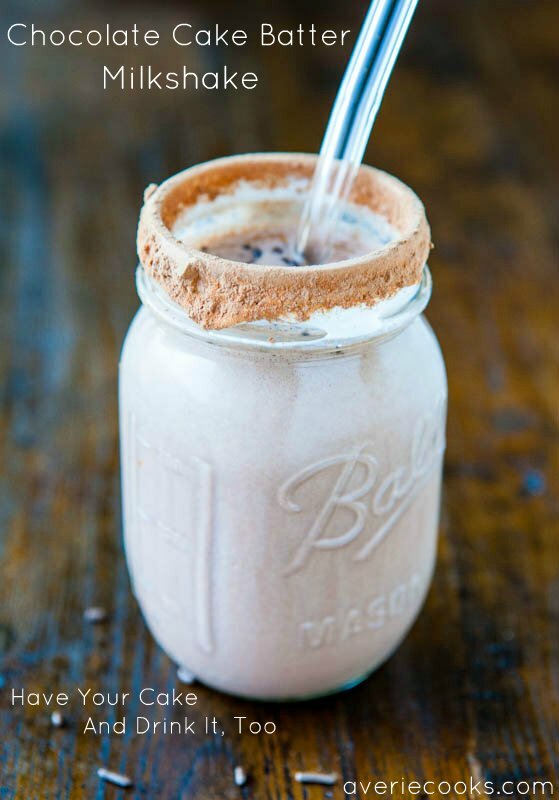 Chocolate Cake Batter Milkshake — If you love cake batter, this is the smooth and creamy milkshake for you! Have your cake and drink it, too! 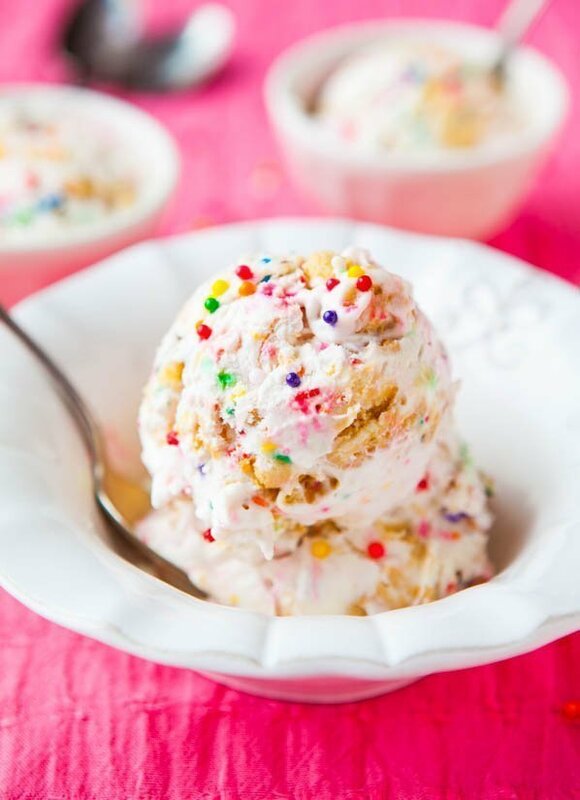 No-Ice-Cream-Maker Funfetti Cake Batter Golden Oreo Ice Cream — It’s full of chopped Golden Oreos, sprinkles, and tastes like Funfetti Cake Batter. No cake mix involved! 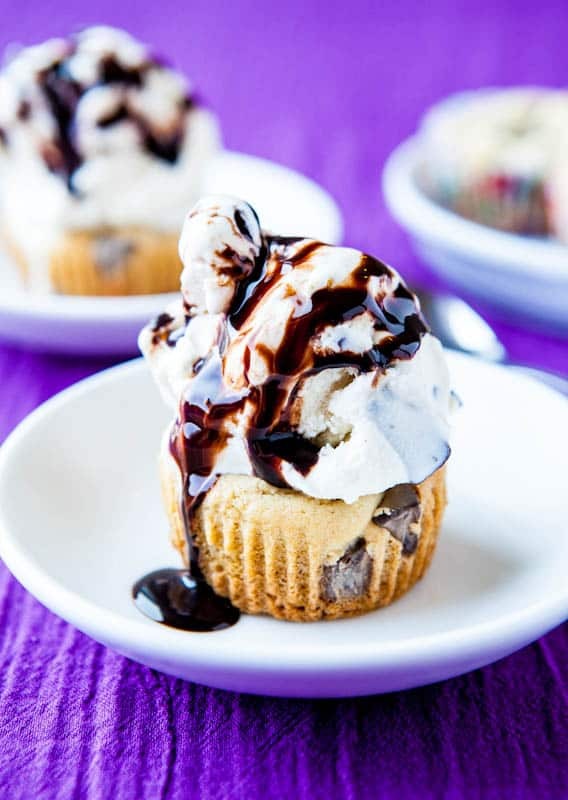 Double Chocolate Chip Cookie Cups and Ice Cream — Chocolate chip cookie dough that’s baked in a muffin pan makes the perfect cup for holding a big scoop of ice cream and hot fudge!! Fast, easy, and a family-favorite!! Have been seeing this on Pinterest but wasn’t sure how it would turn out but have to say your recipes have never failed me in the past so will have to try this one out too! Luckily I have half a can of sweetened condensed milk to use anyways. It seems like the only flavoring this is missing compared to the homemade baileys is a tiny bit of coffee + whiskey right? Might have to add a little bit in and see how it turns out! Omg YES. You have to have fries dipped in it! That was my junior high dream meal :) And thank for pinning! wow, this is what I want. Weather is dipping here and today it’s in 40’s. Uncannily close to the real thing! This drink might be a teeny weeny too easy even for a low fat drink. What a sneaky and excellent recipe detective job that you did. Fries dipped in Frosties are the best! Brilliant! This could be for reals dangerous. 4 ingredients. No ice cream maker. Hello, Frosty every night. Pinned. I know, I want a Frosty every night too LOL. Thanks for pinning! This frosty is just what I need, love your skinny version! OOOOOh! Now I wanna make this and feed it to Michael and see if he can tell the difference! Awesome idea Averie! Oh PLEASE do and LMK the results! Yum Averie! This sounds amazing and so creamy!! What a creative recipe!!! Hi Jen! Thanks for stopping by! I love this Frosty’s but I don’t indulge. Now though I will be able to have a frosty and eat it too! This looks so good- I hate Wendy’s, but I actually really love their frostys!! You and me both wish for that! Frosty’s are so good!! It would be dangerous making them at home but I guess healthier too. AHh! Such a treat to have this recipe in hand. You may have answered a deep craving! One question though, can you recommend a substitution for the Cool Whip for those of us in countries where it’s not available? I’m a missionary in Wales and have been dreaming of Frosties (sad, I know). You could whip cream into whipped cream, sweeten it and try that. It will not be a perfect swap but it could be a good jumping off place! Lite cool whip has 1 gram of saturated fat and 1 gram of fat per serving. By using a whole 12 oz container, you’re having roughly 37.5 servings…. That equates to 37.5 grams of fat or 76% of total fat for the day and 189% (WOW) of daily saturated fat. Not to mention a mere 945 calories alone in the coolwhip. That is only for that one ingredient. Then again, that would be using lite cool whip. So I advise anyone trying to make this to use fat-free for a much healthier version.